Chocolate lovers can't take a holiday to Bruges without stopping at the Choco-Story Museum, which details the history of chocolate dating back to the Mayans in 250 BC, and also demonstrates how the raw ingredients of cocoa are turned into the sweet treats everyone loves. Of course, each tour includes a tasting session and plenty of time in the gift shop. 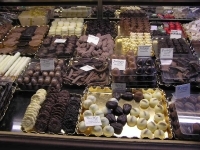 It's tempting to buy right then and there, but keep in mind that Bruges has more than 40 chocolate shops throughout the city! Opening times: 10am - 5pm. 10am - 6pm in July and August. Closed on Christmas, New Year's Day, and from 8 January to 12 February. Admission: €8. €5 for children between 6 and 11 years old. Other concessions available.